Top quality plants that will bloom for months! - Most of our begonias are from the Gent nursery of Arnold Van Peteghem who has been creating the very best new hybrid strains for more than a quarter of a century. Blooms are much larger and more brightly coloured and are borne on extra strong stems making the plants more weather resistant. Variety is half hardy; prefers a sunny sheltered spot and should be protected from frost in winter, either by mulching or by lifting and storing. 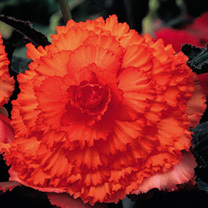 Especially suitable for growing in pots or tubs or for a brilliant display for summer bedding.